Thanks to its design, high definition display and large storage, new iPad 2017 would be the best choice for watching movies on the go. With it, you can kill the boring time when you are teavling by downloading TVshow and movies from iTunes, or transfering Blu-ray movies from discs for enjoyment. However, new iPad 2017 doesn’t has a built-in-BD-ROM or BD player directly. Without BD drive new iPad 2017 cannot play Blu-ray directly for commercial BDs are protected by CSS region code, prevents from copying the digital copy to new iPad 2017. For Blu-ray collectiors, it will be a waste if you guys purchase BD movies from iTunes instead of transfering from BD discs to your new iPad 2017. To watch any Blu-ray movies on new iPad 2017, the best and most economical way is to copy your Blu-ray movies by passing all copy commercial copy protection, and convert them to iTunes playable video format such as M4V, MP4, MOV. So to make this to come ture, what do you need to prepare? Read on. Firstly, an all-in-one professional Blu-ray converter you need to get which could decrypt Blu-ray copy protection scheme and then shift Blu-ray format to new iPad 2017 and iTunes suported format. 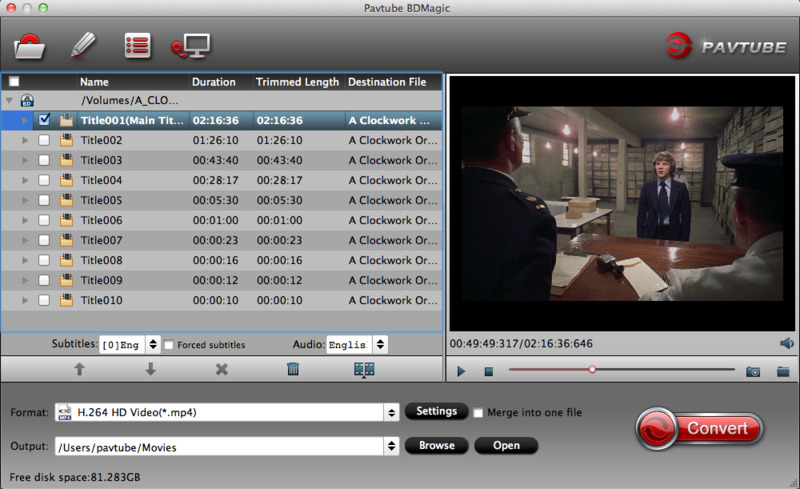 Pavtube BDMagic for Mac, comes as the most powerful software tool for copying protected Blu-rays, no matter the protection system and has the ability of compressing BD movies size. The results are high quality without sacrificing any of the quality from the original Blu-ray. One of extra features is the program has ready presets for you to converting Blu-ray for iPad and other mainstream devices so you don’t need to think what parameters to set. Secondly, a Blu-ray drive. Mac isn’t equipped with Blu-ray drive. So you need an external Blu-ray drive to read your Blu-ray discs that you want to put onto new iPad 2017. There are a huge number of brands you can choose from in Amazon and eBay. Thirdly, enough hard space. Blu-ray has a storage ranging from 25GB to 128GB. When we convert Blu-ray to new iPad 2017, the video will be compressed. But if you insist on keeping high resolution, the video size still will be large so you’re required to have enough storage on your computer hard drive. Step 1: Click “File” to load Blu-ray disc by clicking “Load from Disc”. When the Blu-ray is loaded, all the chapter will be listed on the left. The main title is checked automatically. Generally, a Blu-ray movie will have several subtitle and audio tracks. If you don’t need all the tracks, you can choose your desired subtitle streaming in “Subtitle”. Tip 2: You also can choose to rip Blu-ray with forced subtitle. Just specify English in “Subtitle” pull-down list, and then check “forced subtitles” before converting. When “forced subtitles” is checked, the subtitles appear on the screen only when foreign languages (i.e. Francais) other than English are spoken. Step 2: From its “Format”, you will see hunderds of video format. 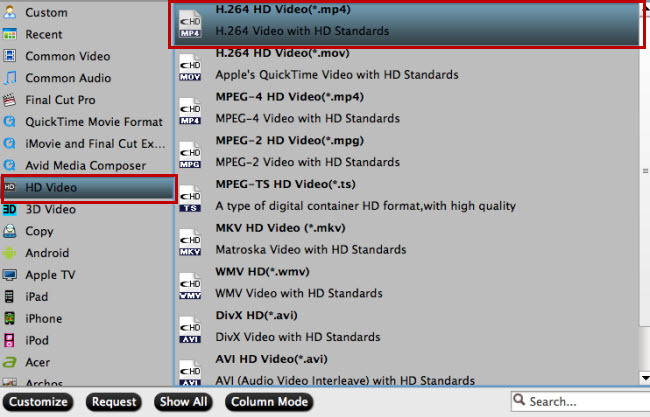 Here we navigate to “HD Video” and select “H.264 HD Video(*.mp4)”. You also can follow your heart to choose one. Such as “iPad HD Video(*.mp4)” from “iPad” category. Step 3: This program allows you to set ouput video more compatible with new iPad 2017. Just click “Settings”, here you can configure video and audio encoder codec, bitrate, frame rate, resolution, and more. Video size are based more on bit rate than pix. You can downscale BD movies to save more storage space by lowering kbps. Moreover, you are able to edit BD movies if you need. Find the pen icon on the main interface, and entre “Video Editor” windows. Here are seven edit tabs for you: Trim, Crop, Text Watermark, Image/Video Watermark, Effect, Audio Editor and Subtitle. 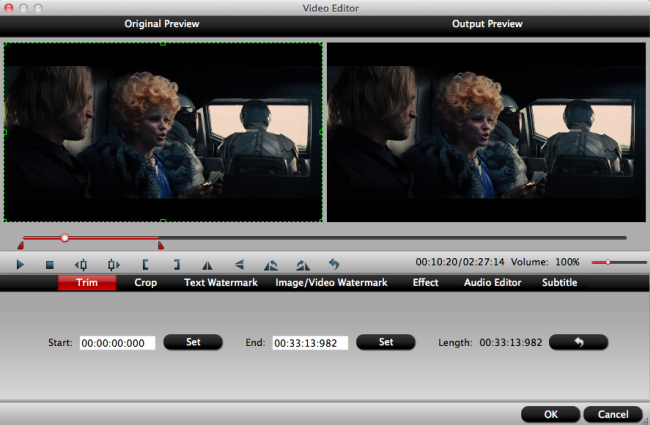 You can cut the long opening and ending as you like, or extract some clip from Blu-ray for iMovie/FCP editing. More funtions are waiting for your exploration. Step 4: After all settings are completed. Return bark to the main interface and click “Convert” button, wait for a while, go to “Open” and find the folder with generated BD movies. Now you can snyc the converted movies to your new iPad 2017 for enjoyment. How to Use Handbrake 1.0.7 to Generate the Best Playback Settings for iPad? How to Add Music, Movies to new iPad (2017) without iTunes? What if I Want to Keep My iTunes Rentals Forever on iPad Air 2/iPhone 6 Plus? This entry was posted in Apple and tagged best blu ray converter, blu ray converter new ipad 2017, blu ray on ipad, blu ray player for ipad 2017, blu ray to ipad converter free by vina. Bookmark the permalink.